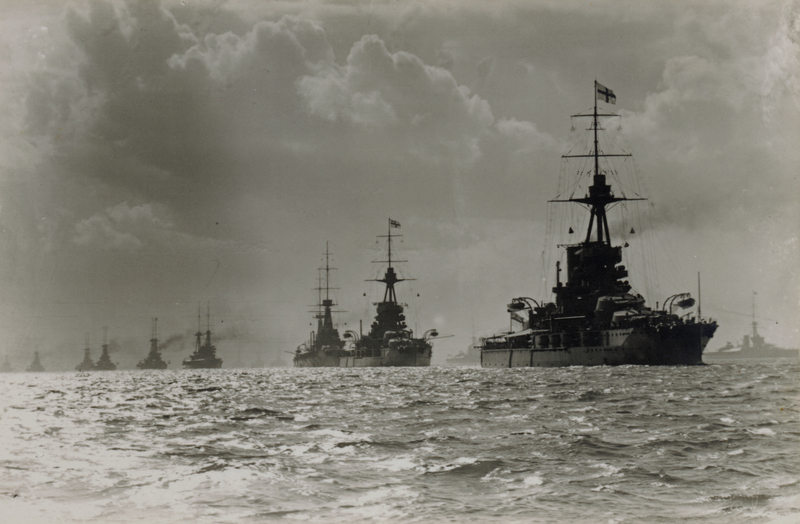 HMS Iron Duke leads a long line of powerful warships steaming across the picture, echoed by a second line of warships seen more faintly beyond. All set against a slightly brooding sky as the ships cut through the sea, with slight waves sparkling in the light. This image exudes orderliness and power. Strong horizontals, emphasised by the landscape format, suggest stability and a sense of balance. Much like a piece of Classical architecture, this photograph conveys a sense of rightness to the order of things, depicting a reassuring world, kept stable by the policing presence of the British Navy. That sense of orderliness is reflected in the pleasing visual pattern in the ships, with each vessel in its designated place. Yet this is also a pattern of power. The sheer number and size of the warships expresses a sense of dominant British sea power. The slightly low viewpoint emphasises the size of the ships as they come to loom over the viewer. As calm as the sea it is sailing on, but nevertheless suggestive of a quiet power waiting to be released, just like the gathering clouds. Or are we looking at the calm before the storm as the powerful Battle Fleet sails out to meet the coming threat. Although Britain had remained the pre-eminent naval power throughout the nineteenth century, it wasn’t until the appointment of Admiral Fisher as First Sea Lord in 1904 that the Royal Navy began to modernise. Facing the challenges of the new century meant taking on board the rapid technological advances brought about by industrialisation, and paying attention to changed political circumstances, in particular the rise of Germany, since its unification in 1871, as a Great Power. As the political position moved away from a fear of Russia and France attacking the far flung corners of the Empire, Fisher saw the build up of the German Fleet in the Baltic and the North Sea as the major naval threat. Fisher thus began to concentrate the Fleet in Home Waters, recalling battleships from the Far East and the Mediterranean. This was also a reaction to new technologies which demanded a change of tactics. No longer would the Navy be able to create a close blockade of enemy ports, partly because of the voracious appetite for fuel of the new fleet and partly because of the new means of attack, particularly motor torpedo boats and submarines, making it dangerous to stay near enemy ports. The Home Fleet would become the Grand Fleet and would be stationed at Scapa Flo in the north of Scotland. The strategy would now be to bottle up the German High Seas Fleet in the North Sea, preventing it from attacking Britain’s vital Atlantic supply lines. Fisher was also a passionate advocate of new technologies. A first step in modernisation was to cut 154 ships which he believed obsolete, and a step which also trimmed the naval budget. He championed technical education, long-range gunnery, torpedo-boat destroyers, submarines, aircraft, and a move from coal to oil for fuel. Although Fisher was keen on building a range of smaller ships, he is perhaps most famous for overseeing the adoption of a new class of battleship – the Dreadnought. Two of Fisher’s favoured principles lay behind this new battleship design. One was the belief in accurate, long-range gunnery – the Dreadnought became an all big gun battleship, armed with ten 12in guns. The second was the ‘need for speed’. Fisher believed that speed was the critical strategic and tactical asset for a warship, so the Dreadnought was created to be the first battleship to be powered by steam turbines. When it was launched in 1906 it was faster, better armed, and better armoured than any other capital ship. This inevitably caused the Germans to react, and a race began to build bigger and better battleships. On the British side this would lead to the development of the Iron Duke class of four super-dreadnoughts which were the Navy’s most advanced battleships at the outbreak of WWI. The Iron Dukes carried ten 13.4in guns in five twin turrets, had powerful 6in secondary armament, and much improved armour. They were also the first class of battleships to have anti-aircraft guns fitted as part of the design. Laid down in January 1912 the Iron Duke itself was launched in October 1912 and finally commissioned in March 1914. The Iron Duke served as flagship of the Grand Fleet and would carry Admiral Jellicoe’s flag at the Battle of Jutland, 1916. This article was featured in issue 41 of Military History Monthly.